Martinique, in the French West Indies, distinguishes itself as being on travelers' "places to visit" list and by their rhum agricole. Depaz Blue Cane Amber Rhum distinguishes its rhum agricole by using 100% blue cane. Château Depaz Family Estate, situated at the foot of Mount Pelée, the highest point on Martinique at an altitude of 4,586 ft., in the city of Saint-Pierre has been making rhum agricole since 1651. Throughout the years, they have also had also had their share of misadventures. When Mount Pelée erupted in 1902, the volcanic eruption destroyed much of Saint-Pierre as well as the Depaz Estate. However not even volcanic devastation could destroy the Depaz spirit, and in 1917, Victor Depaz, the only family member to survive, returned to Saint-Pierre and rebuilt the Depaz Estate and distillery. Having traveled to Martinique in April 2006, I visited the distilleries and learned what makes Martinique rum special. It should be noted that Martinique rum is made from 100% freshly cut sugar cane juice, and that only 3% of the world's rum is manufactured this way. The rest of the rum producing industries make rum using molasses which influence the rum aromas, flavors and even the color of the rum. In Martinique, in order to receive the highly coveted French AOC designation (Appellation d'Origine Côntrollée) and be called rhum agricole, (agricultural rum) the rum must be made in Martinique according to strict government guidelines. Depaz makes their rum using 100% blue cane, which has an exceptionally high sugar content, that is harvested in small quantities in the spring. Perhaps it is the volcanic terroir that gives their signature blue cane its flavor, perhaps it is the high altitude, or perhaps it is the Depaz spirit that makes their Depaz Blue Cane Amber Rhum, 45% alcohol by volume, so memorable. This distinctive rum has an amber color, is aromatic with fresh flowers and sweet sugar cane juice, with caramel and butterscotch flavors on the palate, and lasting warmth on the finish. To complement their Depaz Blue Cane Amber Rhum, they are also producing Depaz Cane Syrup, made using pure cane sugar and water. Cane syrup has a smooth, rich flavor, is used in the traditional Martinique Ti-Punch, and may be used as a luxurious alternative to recipes requiring simple syrup. They have created their rum to be enjoyed in cocktails, like their Midnight Mojito (Depaz Blue Cane Amber Rhum, mint leaves, lime juice, lime wedge and Depaz Cane Syrup), and Depaz Rhum-Tini (Island Ti-Punch, using Depaz Blue Cane Amber Rhum, Depaz Cane Syrup and a small squeeze of lime). I also enjoyed creating a few new recipes using Depaz Blue Cane Amber Rhum and the Depaz Cane Syrup. Martinicans like to drink two traditional cocktails, Ti-Punch and Planteur, where the recipe for Planteur varies from person to person and from bar to bar. 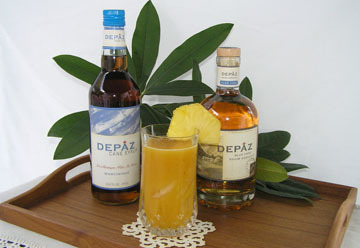 For Luxury Experience's Château Depaz Planteur, I used typical ingredients that you find in Martinique, including Martinique spices, vanilla, and fresh juices, which really make this cocktail special. Fill a bar glass with ice, add all of the ingredients, shake and strain into a tall glass filled with new ice. Garnish with a pineapple wedge, sit back, close your eyes, sip the Luxury Experience's Château Depaz Planteur and imagine you are in Martinique. I combined Depaz Blue Cane Amber Rhum and Depaz Cane Syrup to create a wonderful glaze for meat. I marinated center cut boneless pork chops in the glaze for about an hour and then grilled them. The result was a moist interior with a flavorful, slightly sweet, crispy exterior. Add all of the ingredients to a plastic re-sealable bag. Add the meat and marinate for at least an hour. Grill the meat, basting throughout the cooking process with the marinade. I love salmon that has a hint of sweetness as well as a little kick to it. I brushed the salmon with olive oil on the bottom, (grill side), and then brushed 4 tablespoons of Depaz Cane Syrup all over the top of the salmon. I dusted it with ½ teaspoon of Martinique curry powder, and brushed the salmon again with 2 more tablespoons of syrup to meld the curry powder into the syrup. Grill the salmon and serve with the Pineapple Salsa and Grilled Pineapple. Combine all ingredients in a bowl, and marinate for several hours to meld the flavors. Select a fresh ripe pineapple and remove the rind. Cut the pineapple into slices. Brush each slice of the pineapple with a little Depaz Cane Syrup and then grill. The syrup will keep the pineapple moist and juicy and add to the overall flavor. Cut the grilled pineapple in half and serve with the grilled salmon, or top with vanilla ice cream and serve as a dessert. Depaz Blue Cane Amber Rhum and Depaz Cane Syrup are imported by Kobrand Corporation. Read other articles on Martinique in the Destinations, Hotels and Resorts, Restaurants, Chefs' Recipes, Fashion, Liquor Cabinet and Travel News sections. For more information on Martinique, please contact the Martinque Promotion Bureau at www.martinique.org.